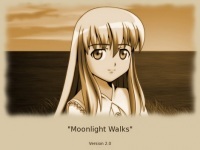 Moonlight Walks is story game in the form of visual novel. It takes around 30 minutes to complete reading the story. The story is about a student taking vacation to his uncle's house on a small island around the Atlantic Ocean. He unintentionally meets a girl walking under the full moon at the beach. The girl appears only when the full moon is emerging. You can read the full story by playing the game. To advance through the game, left-click the screen or hit the Enter key. And to go back to previous conversation, just scroll down the mouse wheel or press PageDown key.